Set in Joseon, story depicts a battle to gain the propitious site for a grave which will produce 2 kings. Filming began August 22, 2017 and finished January 5, 2018. First still image of Moon Chae-Won in movie "Feng Shui." 7 character posters for movie "Feng Shui." the amount of famous people in this film are .... WOW! Sooyi Jul 31 2018 2:40 am Is this related to the movies "the Face Reader" and "The Princess and the Matchmaker"? About the background, Kim Minjae is the Crown Prince who was also played by Park Bogum in drama "Moonlight Drawn By Clouds", and Lee Wongeun is the Crown Prince's son. @LKB Apr 29 2018 2:37 am Lol. Like you, I've been waiting for this since the announcement last year of Cho Seung Woo and Ji Sung starring together in this movie. Now it's almost May and still nothing. I love both actors. I hope they release it soon. LKB Apr 24 2018 6:41 am Release this, already, editors!! Originally they were going to put it in theaters in December or early January... Then filming got delayed and finished the first week of January... But editing usually is done along the way and the final edit is almost always complete within 6 weeks of completing filming, even with battle scenes and CG galore... What the devil is taking so long?! I want to see this (esp.the two megastar leads together!!) sooo much! I don't know if I would care much for it without the stars, but they tend to be fussy about what they do and push their limits/go outside everyday generic programs, even if it means ratings/profit aren't massive (though at least in China this kind of film does really well)! Come on,give us our handsome men in their Joseon garb and hair knots/head gear, already!! Ab Nov 01 2017 9:53 pm Wow. Cho Seung Woo and Ji Sung in one movie? Count me in! Two of my favorite korean actors! Can't wait for this movie. I hope it will be a blockbuster. After this movie, I wish that CSW would do another drama. I want to see him more. piplup Sep 03 2017 10:48 pm So looking forward to this movie!! Can't wait for Moon Chae-Won's acting and for her to be in a hanbok again! 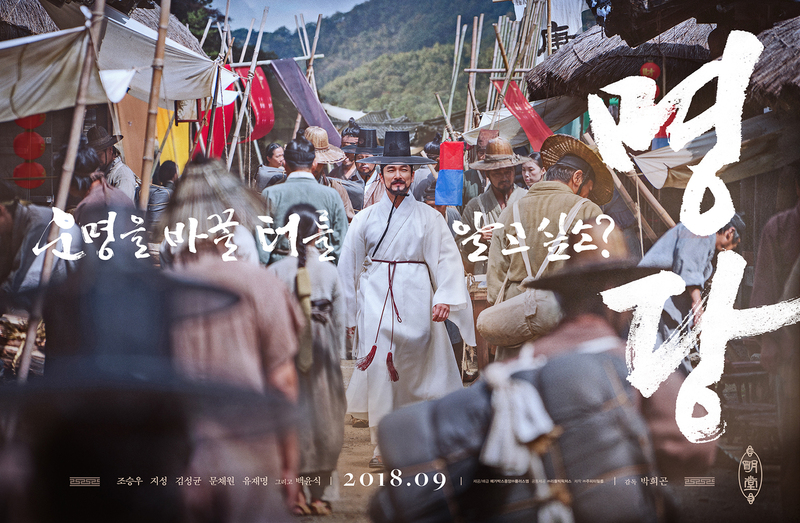 Wanda Sep 03 2017 3:00 am Cho Seung Woo, such a multifaceted and versatile actor, even when he's playing the same kind of character he has the ability to give something unique and different everytime. This is something hard to find and I truly admire his acting skills, let aside his presence on musical stage. Looking forward for this movie. Neth Aug 28 2017 7:36 pm Oh! I'm watching The Great Seer because of Ji Sung and he is filming this movie related at The Great Seer ?? ?...can't wait to see this film. Fairlee Aug 24 2017 7:33 am @luvluv : that's what I thought! joseon and grave site with ji sung. Soo great seer. Wang Yeo yaaaa Aug 23 2017 8:52 am Kim Minjae - the young king from Goblin!! Lee wongeun - young woon from Moon embracing the son! Not only veteran actors but also interesting young casts!! I love Minjae in Goblin so much! His voice and his gaze, his eye acting is daebak!! Bbong Jul 22 2017 10:17 am please, moon chae won accept this movie? dalisay dy Jul 04 2017 1:40 am i love cho seung woo too bcoz of secret forest..i am currently watching all his previous dramas and movies ..aishh, i can't get over him..i am so in love!? fubukito Jun 20 2017 4:44 am Cho Seung Woo!! Yoohoooo!!! Karen Khoo Jun 20 2017 3:44 am Ji Sung in traditional clothes?? Sign me up!